Mark Andrews assesses the high street’s future as top stores vanish in the online revolution. Cast your mind back 10 years, and imagine what a typical shopping trip might have involved. Browse around homeware and clothing from British Home Stores, pick up some electrical goods from Comet. Maybe call into Woolworths for the pick 'n' mix and a CD, followed by a trip to Blockbuster to hire a video. It has been a turbulent decade on the British high street. Big-name stores, which many of us thought would be around forever, have gone the same way as the Home & Colonial, Foster Menswear and Timothy Whites. And while there have been some new retailers that have taken the place of their venerable predecessors, 10 years on there is little sign that the shake-up coming to an end. Professor Mike Haynes, a retail expert at Wolverhampton University, says we should not expect the next 10 years to be very different, with the only question being which of the famous names will disappear. "With an economy that is pretty anaemic, it's not going to take much to push people's spending in quite different directions," he said. "I think there will be many more big names that will disappear from the high street over the next decade." Toys R Us and electronics retailer Maplin are the latest big casualties of the shake-up, both going into administration within hours of each other last month. 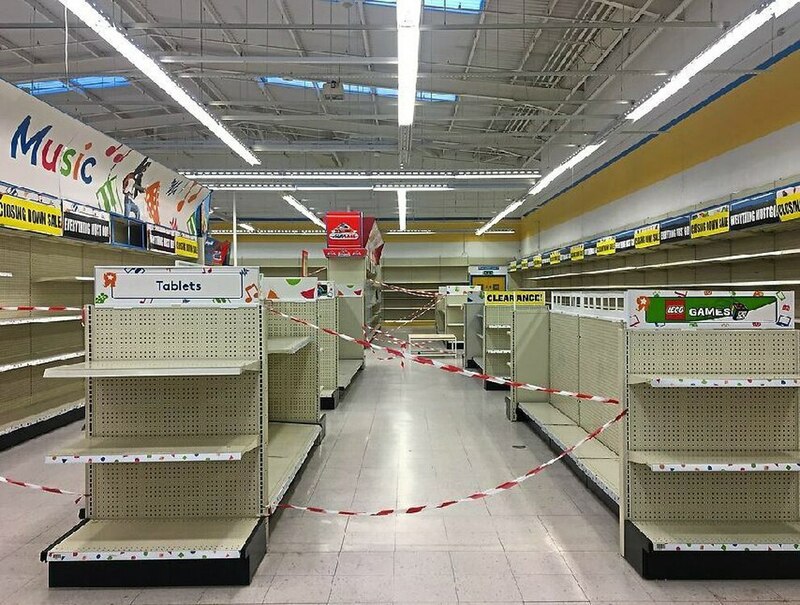 All Toys R Us stores have been confirmed as being doomed, including the landmark store in Oldbury, although the stores at the branch in Shrewsbury have been empty for weeks. Rural supplies store Countrywide Farmers has also called in the administrators, and it would take a brave man to bet against more casualties on the horizon. A new report by the Centre for Retail Research forecasts that 9,500 shops will close this year, followed by 10,200 in 2019. Up to 200,000 retail jobs will be lost by 2020, it forecasts. Earlier this month the struggling fashion retailer New Look announced it was planning to close up to 60 stores as part of a restructuring plan which would also see it negotiate rent reductions on its remaining branches as it attempts to stave off insolvency. DIY and garden chain Homebase is also struggling after an ill-fated takeover by Australian giant Wesfarmers. Last month Wesfarmers said it was keeping all options open, including the sell-off of Homebase, as it announced the closure of up to 40 branches. And with traditional everything-under-one roof department stores rapidly becoming an endangered species, it is little surprise to see House of Fraser and Debenhams also on the register of those considered vulnerable. There is a certain irony about the demise of Maplin, which began life in 1972 as a mail order business operating from the bedroom of founders Sandra and Roger Allen. The company grew rapidly in the 1980s as home computers became more common, and in the 1990s it began to grow into a national store chain. 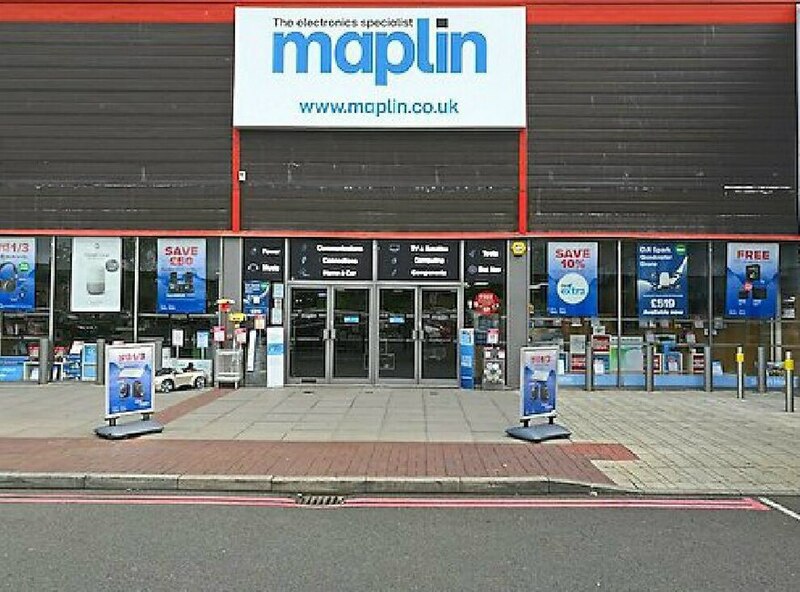 Maplin can be found in town centres across the West Midlands and in recent years it has moved onto retail parks, with larger stores. However, financial overheads have caused it to struggle against competition from online, mail-order retailers. Administrators were appointed at rural supplies store Countrywide in March after years of heavy losses. The company, which has branches in Market Drayton, Whitchurch, Bridgnorth and Bromsgrove, began life as Bedford Farmers in 1902. Rapid expansion saw it become a public limited company in 1996, and it was then rebranded Countrywide in 1999. Rival Mole Valley had proposed a takeover of the ailing retailer, but last month the Competitions and Markets Authority voiced concerns that this could reduce competition and push up prices. The American toy retailer, which was due to celebrate its 70th birthday this year, is now in administration on both sides of the Atlantic. When it arrived in Britain in the mid-1980s, its format of large format out-of-town warehouses was blamed by some for the decline of the traditional high-street toy shop. The company is accused of failing to move with the times as it faced increasing competition from online shopping and large supermarkets. Now all stores in the UK are to close within weeks and many, like the branch in Shrewsbury, above, are already bare of stock. Homebase has been in trouble since a disastrous takeover by Australian giant Wesfarmers. The DIY chain’s boom years were in the 1980s, when it trebled in size after taking over rival Texas Homecare. But even before the Wesfarmers takeover two years ago, Homebase was struggling to compete with its larger rival Kingfisher, which through its B&Q and Screwfix brands held 40 per cent of the UK DIY market. Wesfarmer’s began the process of rebranding Homebase stores as Bunning DIY, a successful brand in Australia, but with little success, and the takeover was blamed for an 86 per cent fall in Wesfarmers’ profits. 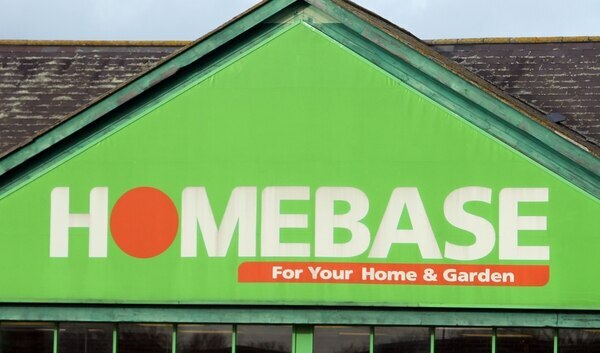 Last month the company announced the closure of up to 40 Homebase branches, and chief executive Rob Scott said Wesfarmers was “keeping all options open” – including the sale of Homebase. In the 1990s, New Look was the new kid on the high street, and its growth seemed unstoppable as new branches opened up everywhere. The following decade the growth was accelerated by the opening of new stores overseas, and the company now has 900 branches in 19 countries, and in 2008 it was turning over nearly £1.5 billion, making a profit of £180 million. So what went wrong? An expansion into men’s fashion has been met with mixed results, and executive chairman Alistair McGeorge recently admitted that the chain had opened too many stores in the UK, leading to closures and cuts. The department store sector has been feeling the squeeze for some years, being particularly hit by competition from online retailers, as well as the new generation of giant out-of-town supermarkets which are department stores in all but name. Nevertheless, eyebrows were raised when the chain, which recently opened a new store in Wolverhampton, announced a 42 per cent fall in profits in September. Disappointing Christmas and January sales have compounded its woes. The company recently announced a major restructuring with job cuts and possible store closures. Beatties owner House of Fraser has suffered a traumatic time since its takeover by the Icelandic Baugur Group in 2006. Baugur filed for bankruptcy in 2009, in the wake of the Icelandic banking collapse. It is now 89 per cent owned by Chinese conglomerate Sanpower, although British businessman Mike Ashley has an 11 per cent stake. At the moment it is seeking rent reductions with the landlords of a number of stores. Originally an offshoot of an American retailer, Woolworths arrived on these shores in 1909 as a Poundland-style fixed price discount store. The company, which was already struggling, suffered heavily during the credit crunch of 2008. In July that year, its board rejected a bid buy Woolworths’ 819 stores for £50 million. In September that year Woolworths posted losses of £99.7 million, and in November the company went into administration. Comet had been founded by George Hollingbery in 1933 as Comet Battery Stores, and diversified into radio rental before opening his first shop in Hull during the 1950s. Comet pioneered the discount electrical warehouse, opening large out-of-town branches across the country. The company was hit hard by the credit crunch of 2008, and in June 2011 Comet posted a loss of £8.9 million, its first in 16 years. In November that year it was sold to investment firm OpCapita for a nominal £2, but went in to administration after just one year. BHS appears to be the classic example of a struggling mid-market retailer that was tipped over the edge by the weight of its pension obligations. The company was purchased in 2005 by tycoon Sir Philip Green, but later sold for a £1 to controversial businessman Dominic Chappell. In March 2016, BHS negotiated a rent cut, but there was a £207 million deficit in its pension scheme. The company went into administration the following month. 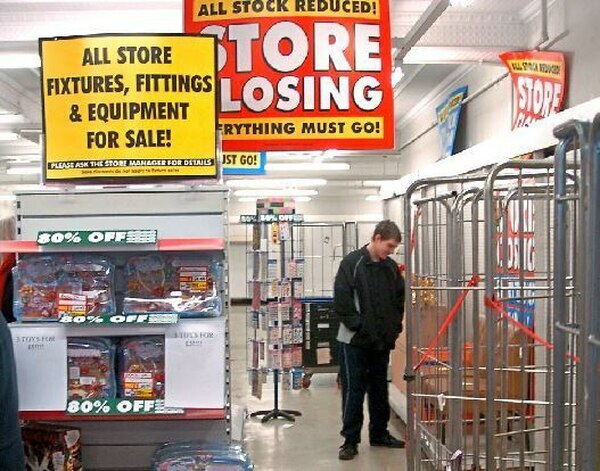 A classic case of boom and bust, Blockbuster Video lasted just 14 years in Britain. The switch from videotapes to DVDs increased pressure on the chain and the market continued to decline until in 2013 the UK arm of Blockbuster was placed in administration. It was purchased two months later but ceased trading in December that year. It was the collapse of Woolworths, which went into administration at the end of 2008 following the credit crunch, which first set the alarm bells ringing. There had been murmerings that all was not well at Woolworths for the previous year or so, but few thought it would disappear. The chain had even printed the posters to celebrate its centenary in the UK in 2009, and Alan Sugar had increased his shareholding in expectation of a takeover. 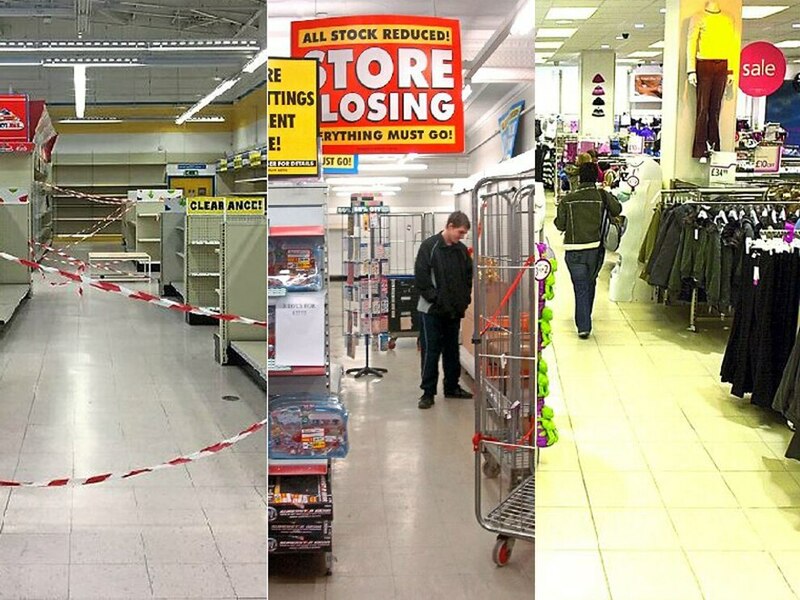 When the last Woolworths shops closed in January 2009, it sent out a very clear message: no retailer was too big, too famous or too long established to fail. Indeed, it might be said that the bigger they come, the harder they fall. New Look, founded in Taunton by Tom Singh in 1969, grew rapidly during the 1990s, and now has 900 branches in 19 countries. Recently, it decided to expand into men's fashion, opening up a number of extra stores. Alistair McGeorge, executive chairman of New Look, admits the company has overstretched itself. “Given our challenged trading performance and over-rented UK store estate, we are having to take tough but necessary actions to reduce our fixed cost base and restore long-term profitability," he says. How are other chains faring? New Look is hoping that the streamlining, which will see around 980 redundancies out of a workforce of 15,300 over the next six to nine months, will be enough to return to the chain to profit, but few argue it will be a tough road ahead. Debenhams recently announced a major restructuring, which will see job cuts and possible store closures, following disappointing Christmas sales. It has only just moved into Wolverhampton's Mander Centre, providing the city centre with a new flagship store. House of Fraser – which controversially took over the Beatties chain in 2005 – is also in talks with its landlords to reduce rents at a number of stores. Interestingly, Sports Direct tycoon Mike Ashley has acquired a significant stake in both Debenhams and House of Fraser. Some of the casualties, such as Blockbuster, simply reflect advances in technology; the days of renting a videotape for the weekend are long gone. Competition from online retailers – which are not hamstrung by the high rents and rates of high street shops – are another factor. But Professor Haynes says some retailers are more vulnerable than others. And again, it is the large, mass-market retailers that are feeling the pinch. The 'squeezed middle' has in recent years become the preferred cliche of the politicians, but Prof Haynes says it is the middle-of-the-road stores, which have little to differentiate themselves from their rivals, that are most at risk. "People in the middle are either moving upmarket to Waitrose, or switching to Aldi and Lidl to save money," he says. "The money they save at Aldi or Lidl will allow them to spend on something at Waitrose. "The retailers in the middle of the market, Tesco, Asda, Morrison's and Sainsbury's, are being pushed out." Retailers which do not have a unique selling point may also find the years ahead difficult, he says. "The problem with Woolworths was it tried to be everything to everybody," he says. "It is similar with Homebase. On the one hand it is competing with B&Q, but it is also competing with Wickes, which is a more specialised market. It kind of straddles the middle. "It's got building supplies, DIY stuff, a lot of gardening stuff – what is it for?"